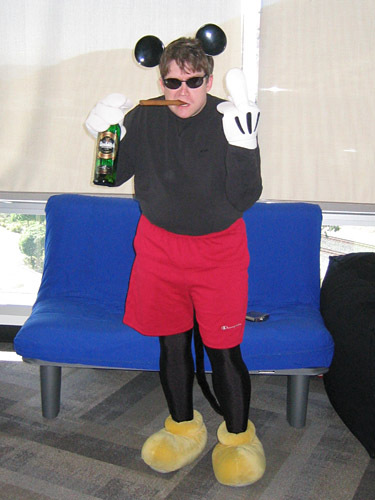 My Drinky Mouse outfit: The slippers look great, but hurt like hell. If I have learned one thing from years of inconsistent cosplay, it’s this: Don’t forget your feet. I’ve had more fun ruined by crappy footwear. I go to great lengths to get everything right and then an hour into whatever I’m doing, suddenly I’m getting blisters or my feet start cramping or whatever. Sneakers with your Boba Fett armor is something of a cop-out, but I understand why people do it. Still, I have always felt there had to be a way to have quality, comfortable footwear that makes sense with your outfit, no matter what it is. For Ghostbusters, I’ve had the same pair of military combat boots since 1995 or so. These were somewhat infamously a gift from Capcom. To promote the then-unknown PlayStation game Resident Evil, the PR team sent journalists a single combat boot with instructions to buy a head-sized melon, draw a zombie face on it, then wear the boot and practice stomping. Cute and clever, but not very functional, of course. A friend at another outlet mentioned he had gotten a boot too, and it turned out, together, we had a matching pair — in my size. So I put in some comfy insoles and, 17 years later, they are perfectly broken in. I wear them every time I get into my GB uniform. Thanks, Capcom! For everything else, I’ve struggled. I bought some handmade medieval shoes for the faire which are nice, but tough for long days and uneven terrain. I bought some really crappy fake Jedi boots which were an absolute nightmare. I always dreamed of just having one pair of boots that would work with any costume: ren faire, Jedi, Steampunk, Firefly. Surely there had to be one pair of calf-high boots that could pass muster in any of those universes? We’re not talking anything too difficult — simple brown leather. But everywhere I looked, it was a case of stylized or prohibitively expensive stuff that looked too sci-fi or too motorcycle or (especially) too western. I don’t want buckles. I don’t want visible zippers. I don’t need Mal Reynolds replicas. And I don’t want no fancy stitchin’, pardner. I just want brown leather calf boots that I can pull on and tuck pants inside them. C’mon, internet, show me what you got. It took a long time, but I did find them — the Oak Tree Pale Rider Boot, which had the look and the length I wanted. And then I saw the price…$230. Oh snap. I’m the kind of guy who buys shoes when they are on clearance and I’ve never paid more than $125 for shoes (and those were like fancy overengineered fitness sneakers). But this is when the little voice in my head reminded me: Don’t forget your feet. I not only remembered the shooting pains from the $35 crappy Jedi boots, but I also realized I was buying these things for four different outfits. Spread across genres, $60 for each sounds like a good deal. And hey, didn’t I get those black combat boots free anyway? The universe had already been kind. I went for it. Seriously, costume geeks: Don’t forget your feet! Start your outfit with the footwear and work your way up. You’ll be much happier in the long run.